but I want to focus today’s post as a “I am my daughter’s Mom” post. I will announce the winners of my Market giveaways this Friday. Isn’t it interesting how once one has kids or a kid (in my case), more often than not, one is known as the kids’ or kid’s parent?! The reason I picked making ornaments as our projects is that I like the fact that the ornaments can be stored carefully and added each year, and they are definitely something Miss Baby can keep with her for the rest of her life. Miss Baby started a huge project for her size/age in summer 2017. 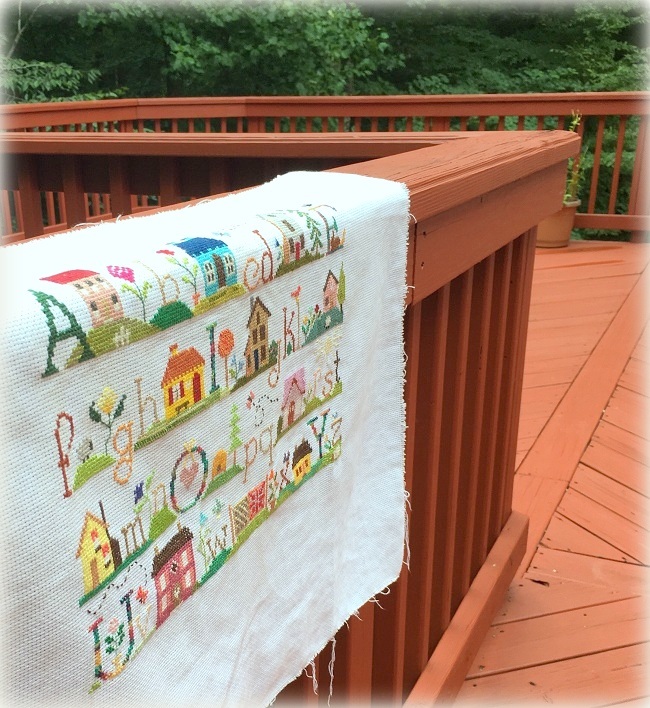 She embarked on an adventure in stitching a full sized sampler! It took her a year, and she finally completed her ABC des Maisons by Jardin Prive (a French designer) this past summer before the new school year. In stitching this sampler, she was adamant about selecting her own colors. Her words, “Mom, I don’t like it when they tell me what colors to use!”. 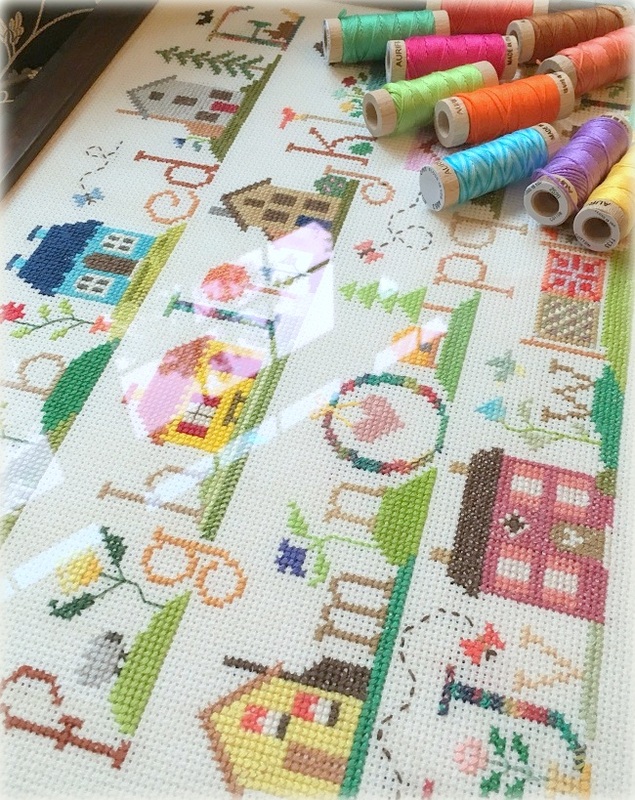 So she stitched the sampler with an assortment of Aurifil’s embroidery floss, Aurifloss. I actually got it framed in time for the sampler to be displayed at Houston Fall Quilt Market this year. 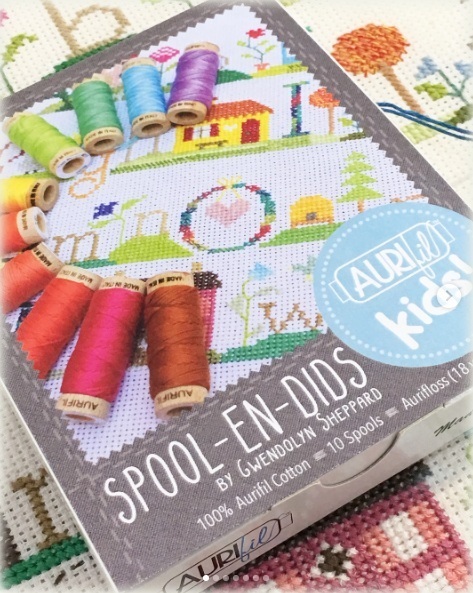 We are really excited, happy and honored to be a part of Aurifil’s AURIKIDS program, an initiative focuses on reaching the next generation of sewist and crafters. Miss Baby (her name is actually Gwendolyn now that the cat is out of the bag, haha!) 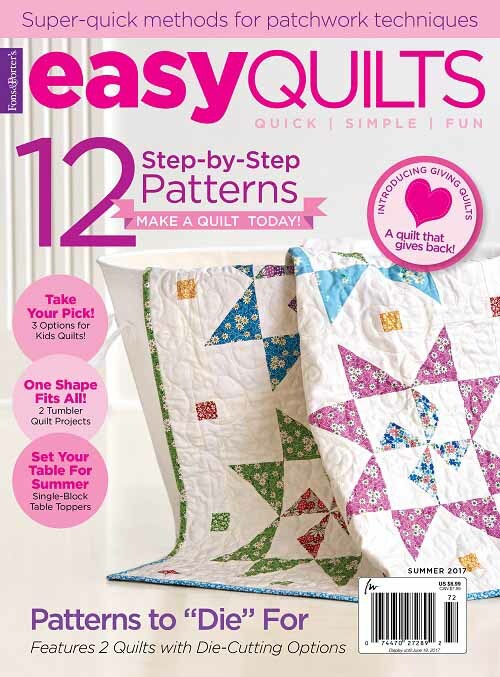 debuts her own thread collection with Aurifil at Fall Quilt Market in Houston this year! It was a big moment, a huge moment, in an 8 year old’s life! The only disappointment for her was that she didn’t get to go to Market with me. This floss collection is ready to ship in this month in case you would like to give this as a Christmas present. 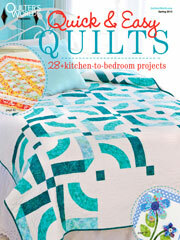 You should be able to order them at your local Aurifil dealers. We will kick off 2018 with a monthly program making ornaments for kids. To keep the mother/daughter theme, these ornaments will be collaborative projects between an adult and a child. 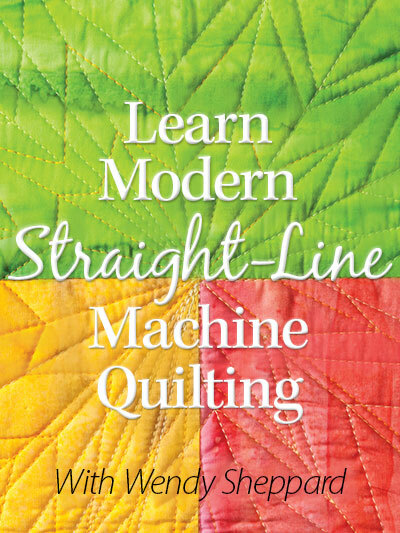 Ask if your local Aurifil dealers are participating in the monthly program starting in 2018. They can also contact Aurifil for more information. Here are a few of the ornaments we will be making. Kids these days have so many entertainment outlets. Being able to pass on the love of needle and thread to my daughter has been one of the most gratifying things I have ever accomplished as a mother. So I hope grandmothers/mothers/aunts out there will join in the fun to help our youth to discover, preserve and prolong the legacy of needlework. Thank you for stopping by! I am already back at it as I have outstanding pattern instructions to turn in… but such is life! I shall catch up with you later! 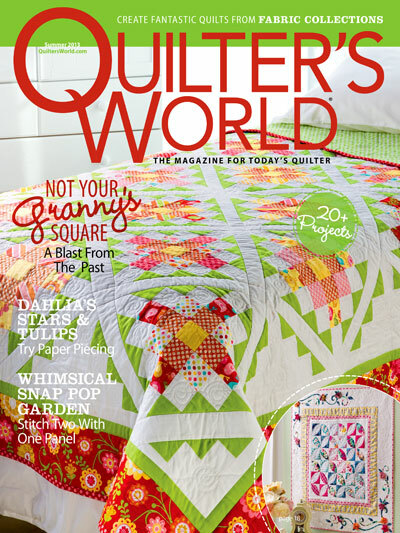 This entry was posted in Needlework and tagged Aurifil, Aurifloss, Needlework, Spool-en-dids, Stitching With Kids. Bookmark the permalink. ← Twas the few hours before I leave…. & Market Giveaway! Congratulations to Miss Gwendolyn! What a lovely sampler! How special that your daughter loves stitching as much as you do! Her stitches are so neat and tidy and I love her colors. I’m looking forward to finding out the imaginative color names she came up with. I think cross stitch is very relaxing. Think of you often!! Gwynette, where in NW Ark? I live in Lowell. You should have let her go. What an experience she would have had. 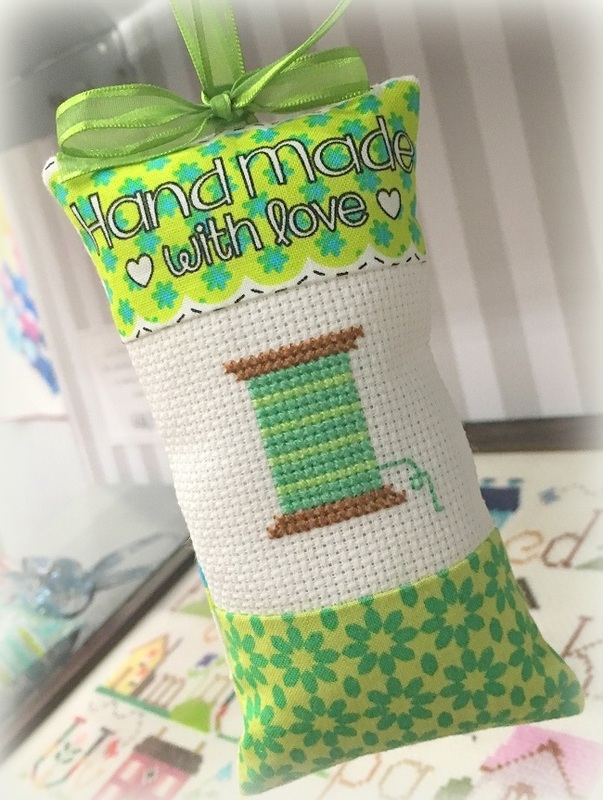 Gwendolyn has accomplished so much in her lovely stitching! How special that she is getting to experience all of this with you and also having the special honor of getting to name all of her favorite threads in her own collection of embroidery threads. I can see the two of you enjoying this adventure together for many years to come. Congratulations to you both and may the Lord continue to Bless you and your family! Congratulations to Gwendolyn, and I’m so excited to see this project progress. Awesome idea and I need to get this box, for me. Hugs! 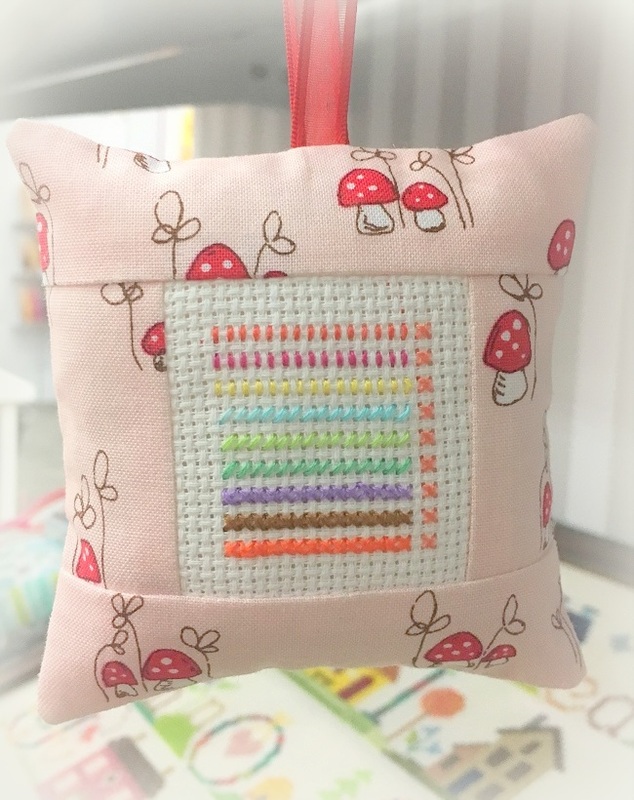 Please tell Miss Baby she did a fabulous job selecting her colors and stitching the sampler. I am very impressed! The sampler is just awesome! Way to go Miss Baby! Beautiful work! Now I am anxious to start making ornaments next year with you! 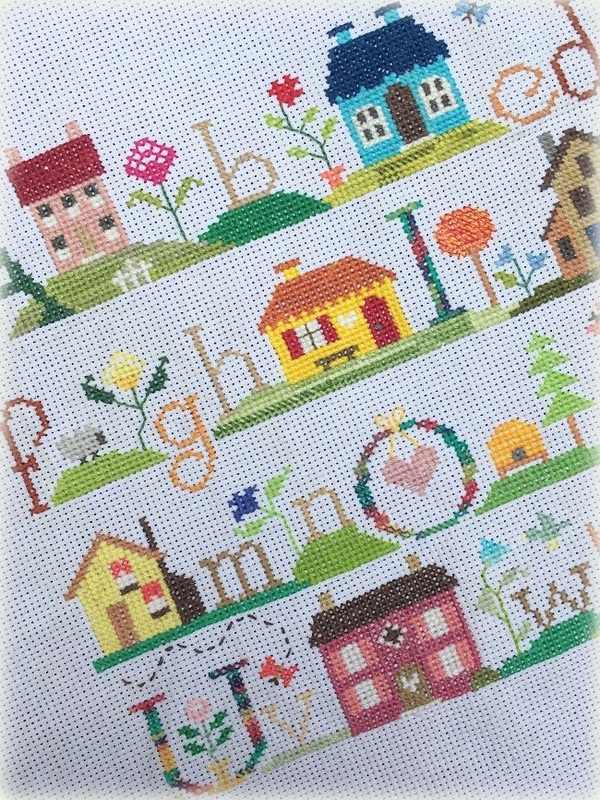 LOVE all the cross stitch projects! What a gorgeous work and well done mother and daughter team. I am in a Week! That last bit of the sentence was supposed to be “I am in awe” . Sometimes those iPads make funny word connections!! What a wonderful art to share with mother/daughter. The ornaments are so pretty and I love the idea of ‘flowering’ the circle print fabric – something my granddaughter could try..
Good for Miss Baby for choosing her own colors—she did a great job, not only color choices but also in workmanship. Kudos! I’m so impressed. The work of a grownup for sure. Absolutely gorgeous! Congratulations to Miss Baby (young Gwen will always be Miss Baby to me). I’m so thrilled to have her become the first #AuriKids liason. And, I look forward to her monthly program. I’m also hopeful, that while this is Miss Baby’s time in the light, that you’ll periodically also share insights from a mother’s perspective on how you managed time, encouragement and focus for her throughout the years. Her skills have improved and are now to be envied by myself and many others, as is her eye for color and design. But I’m confident she’ll be a great role model for other kids. You have a very talented daughter. I am glad she picks her own colours. I do exactly the samr. It stops your work looking like everybody elses. Good for her. I wish I had grand daughters. Not that I would change my boys for a second. But I would love to sew with girls. May you have a long and fruitful sewing career Gwendolyn. That’s so exciting — how wonderful for you both! Can’t wait to see the threads, ornaments and Gwendolyn’s poems! How beautiful the sampler is. I can’t imagine someone else’s idea of colors than Miss Baby’s. I remember seeing a post about it early on. It’s very special that Gwendolyn had the perspicacity to complete such a project! She definitely has her lovely mom’s talents. Congratulations Gwendolyn and Wendy! You make an awesome daughter/mom team! What a special bond you have. Best wishes for many more successful endeavors. I’ve been wondering what Miss Baby ( or is she getting too old for that appellation?) has been working on. For the last 20 years I still walk down a street and hear “Hi, Joy’s (or Bonnie’s or Emma’s) Mom”…..lol. I know you are so very proud of her! Congratulations to both of you. Wowzers! Gwendolyn has really created a beautiful piece. 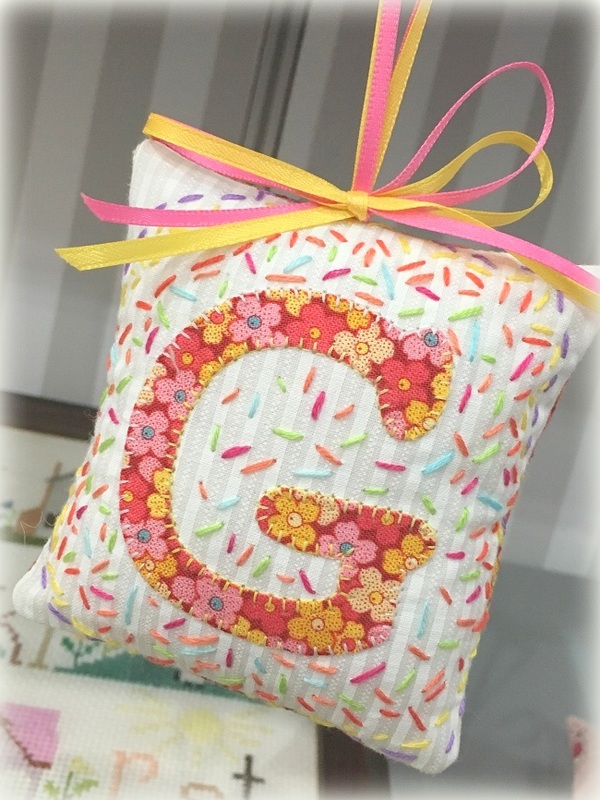 How great to be able to inspire others to try their hand with stitching.Well done Gwendolyn. Well done Wendy. I still have a clear memory of sitting with my little babushka while she tried to teach me to embroider. Sweet Miss Baby’s hand work is marvelous. I love this path that both of you are taking together. You are a wonderful mother and so inspiring to others. I hope to assist my grand daughters make their way through sewing and handwork. Congratulations, Gwendolyn! And Wendy, this is deeply touching and special! Oh my goodness! Gwendolyn is so talented. Just like her mother! Love, love these! Gwendolyn’s stitching is just awesome! 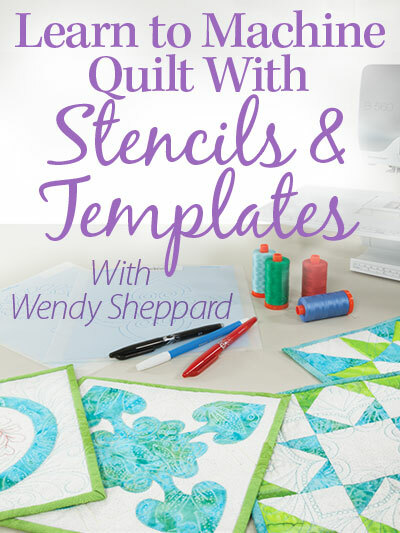 Wendy, I think it is marvelous that you have passed on your love of stitching to Gwen. In my family it tended to skip generations, my grandmother, me and ow my granddaughter. Gwen’s sampler is wonderful. That is fabulous news for both of you. 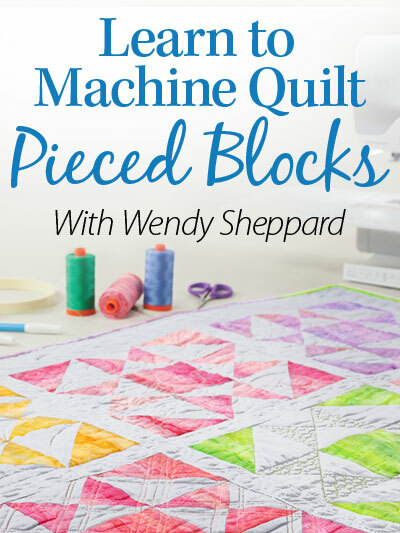 I know she has worked so diligently on her projects for many years so she has deserved the honor – as have you for being her teacher and passing the love of sewing on to her. I am excited for both of you. This is so wonderful for you and your lovely daughter. Congratulations to you both. I look forward to more details. Gwendolyn’s sampler is ah-mazing! This is a great accomplishment, Gwendolyn! 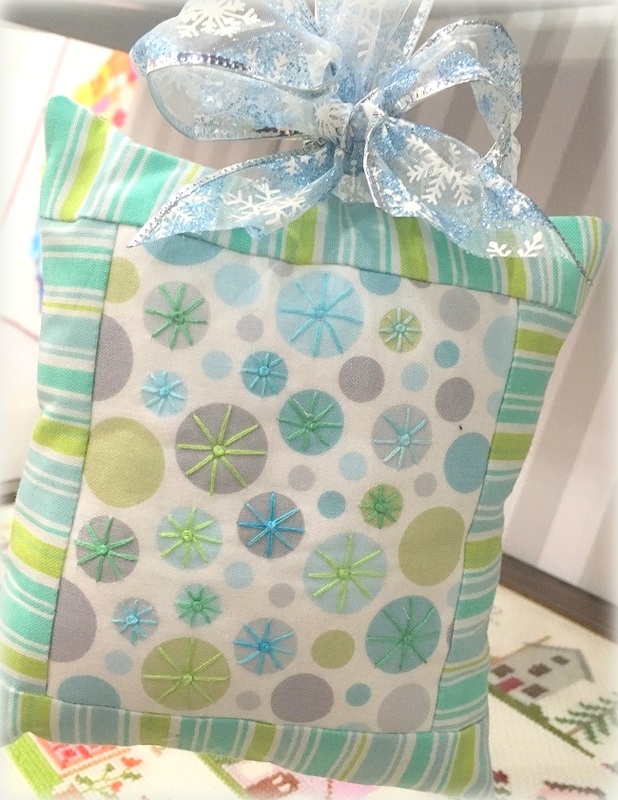 Your completed sampler, and your own Aurifil thread collection! You go girl!! Wow, congratulations to Gwendolyn! How exciting! Oh my goodness, this is amazing! Huge congratulations to Miss Baby. She inherited the stitching gene from her talented mother. Those ornaments are adorable and I hope my daughter will want to make them all. No other words except WOW! This is truly amazing!! She is on her way to having a great hobby/career as she grows up. You’ve done a great job Wendy!!! Miss Gwendolyn, you are AWESOME!! You do excellent needlework and your choice if colors is right on! Keep up the good work; I see a lot of blue ribbons in your future. Thank you for sharing your work with us. Your mom is an excellent teacher. I love the work you do.